More than a guidebook, Classic Hikes of the World is a major contribution to our understanding of these extra-ordinary places-it is truly a book to hike by, and a book to dream by. From Canyonlands to the Alps, from the Rockies to New Zealand, from Kilimanjaro to the Everest Trek, this book has it all. A lavishly illustrated account of twenty-three unforgettable backcountry adventures to the world's most enchanting places. After six years of work, author Peter Potterfield's new iconic volume on hiking in North America is now available. "Potterfield brings savvy insights, practical planning tips, detailed route info and a refreshingly stoked, conversational tone. (Classic Hikes) can be hauled at least as far as the trail head . 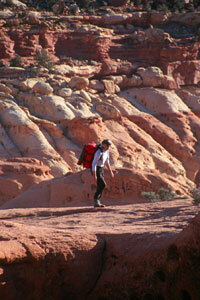 . . but far more transportable is the inspiration Classic Hikes evokes." "Peter Potterfield is the ultimate guide, he steers us down wild trails in magic boots, lighting the hidden paths and secret sights, vividly illuminating in great detail the logistics, hazards and strategies to tramp among the wonders of the world. This is a dream book, a catalog of classics, of all the walks to do before we die." Hiking up the aptly named Frying Pan trail in Capitol Reef National Park, southern Utah. Classic Hikes of the World will help you realize your dreams of hiking among the world's highest peaks and most scenic canyons, discovering wilderness far from the clamor of civilization, encountering rare wildlife, glorying in sunsets over glacier-clad ranges, and feeling the joy and achievement of hiking some of the world's most spectacular trails. Peter Potterfield has selected the great hikes of the world from personal experience, having traveled and photographed hundreds of trails to arrive at this selection. The adventures described range from weekend overnights to four-day hut trips to epic journeys that require several weeks out and back. None of the hikes covered in Classic Hikes requires technical mountaineering skills. This comprehensive guide provides an in-depth look at hiking routes through the most exquisite landscapes on Earth. Features include: details on trail conditions, levels of difficulty, best seasons, approach strategies, hazards, and precise route maps. Hikes include: John Muir Trail, California; Wonder Lake to McGonagall Pass, Alaska; Tour de la Vanoise, French Alps; Kungsleden, Swedish Lapland; K2 Base Camp; Grand Canyon rim to rim; Mount Kilimanjaro; Wonderland Trail, Mount Rainier; Cerro Fitz Roy, Argentina; and Shackleton's Crossing, South Georgia.